Freedomotic is described as a ‘Smart Spaces Framework’ and is designed to be the glue to connect together all the elements of your building automation and be the decision engine to control what happens. I t is extensible and so any new sensor/actuator/thing you can connect to can be made to work with it. For example it could connect to your Google Calendar to see when you are on holiday, and turn down the heating, or tweet you when the cat comes home. It is written in Java and can run on Windows, Linux, Mac or anything with a Java environment. Better still, it is open source and has a community of developers supporting and nurturing its growth. Freedomotic is up and running in the Setfire Labs and so we will be hacking about with some plugins and seeing what fun we can have with it. 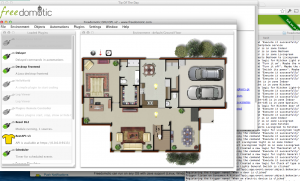 This entry was posted in Building Automation, Freedomotic on August 9, 2014 by Jonathan Clark.